Are you searching for spelling curriculum for homeschooling? I was too, until I finally decided to create something that would work for us – a Grade 1 Spelling Workbook! It was time to buckle down and add spelling to my 6 year olds homeschooling day. So I found some weekly spelling lists from the internet and thought we were all set. But now what? Give a list to my Grade 1 student and ask her to look at it and learn it? Hmm. If she was older that would no doubt be the easiest low fuss way, but at 6, I might as well be telling my 6 year old to sit quietly for a few minutes and do nothing, which would go something more like “Ok I’m looking at the paper…I wonder how deep I can poke this pencil into the eraser…oh look a shiny object!” You get the idea. So I would sit with her, and try to help her learn the spellings, try to show her the sounds each part of a word made, sounding it out, etc. But, I just felt like I needed a better way. Then there’s the traditional end of week spelling test. My daughter would do pretty good on that weekly spelling test, but she would often not remember the spellings after that week. My other issue was when she did the spelling test, her letters were all different heights and sizes, some capital, some lower case, doodles all over the place, it was very messy. And so after weeks of work, kid testing, revising and more revising, the Grade 1 Spelling Workbook was born! 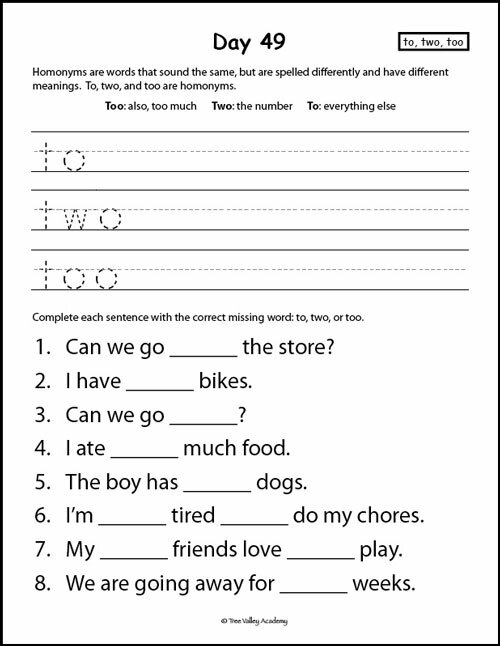 The Grade 1 Spelling Workbook is a 99 page downloadable .pdf. It contains a 230 day (or lesson) plan to learn the spelling of 400+ words. The first 100 fry words are included in this list. I like that I have a concrete plan for each day and we’re not just randomly working on a list of words hoping she’ll succeed in spelling. or since typical school years are around 180 school days, it’s easy enough to combine 2 lessons at separate times in a day for 50 of those 180 days. Dictation is sentence based instead of word based using any of the words they have learned to date. There is lots of repetition and review of previously learned words. The end goal is for the student to really have learned the spelling of 400 + words and not just have memorized lists of words to pass a weekly spelling test only to forget shortly after. Instead of memorizing a weekly list of random, unrelated words, many word families are explored. This makes learning the spellings that much easier and quicker, as children will be able to make connections between words and see the patterns. The lesson plan also includes time for kids to explore word families without writing, using letter blocks, scrabble letters, or any other letter manipulative. 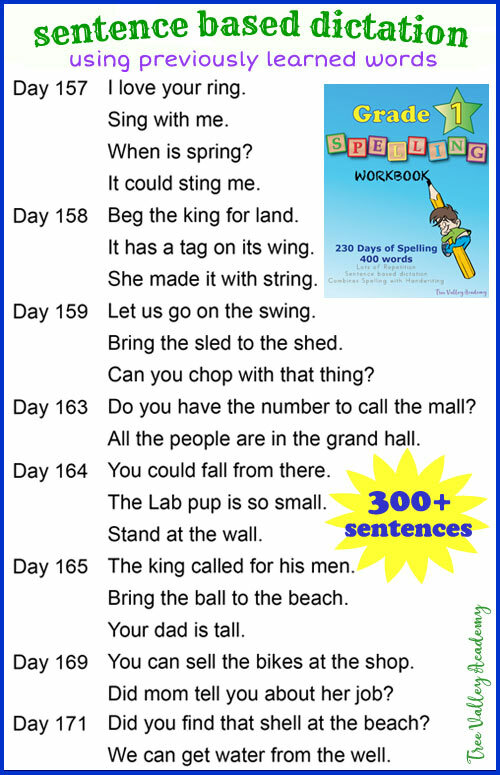 There are 27 blends & digraphs explored, as well as homonyms, making words plural, and more. Learning the letter combinations that make up different sounds, helps the student learn to combine the spelling of the different sounds in a word and learn to sound out a word when spelling. Spelling goes hand in hand with good handwriting as both skills are needed when writing. 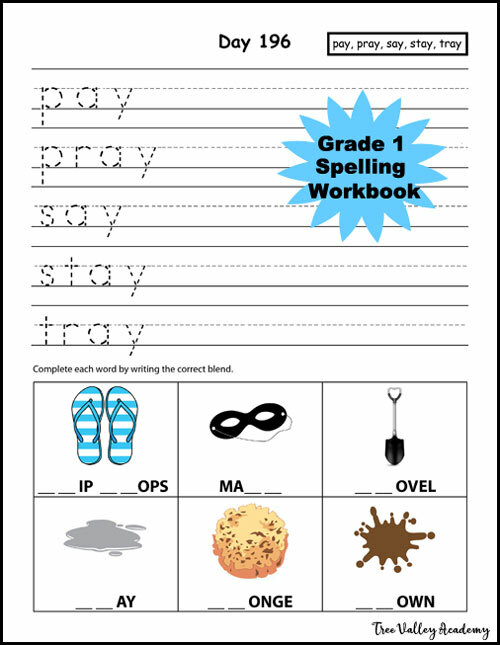 So the Grade 1 Spelling Workbook combines spelling with learning to print the letters neatly with a special focus on the lowercase letters. With more than 300 sentences to be dictated, there is lots of practice to learn when to use lowercase letters and when to capitalize a letter. While I am generally all about making learning fun, admittedly this probably can’t be categorized as all fun and games. Because, let’s be honest, how many kids love focusing on handwriting? I know my 6 year old doesn’t. In fact, I would be lying if I told you there were no tears shed the first 2 handwriting days we did. My daughter doesn’t always use a proper pencil grip and usually holds her pencil with her wrist bent funny. This causes her to often print her letters going up rather than down (i.e. think of a lower case L) , and she often writes her numbers backwards (i.e. P instead of a 9). While I choose not to make a big deal of how she holds her pencil and prints her letters in her other work, I did want to set the bar high for when she is practicing handwriting with her spelling words. So those first 2 days were a bit of a battle of the wills between us. But after she knew my standards, the following handwriting days went relatively smoothly. My daughter’s favourite part to date is unscrambling words with the help of blocks. She figured out that if she grouped letters that made up a letter blend or word family, this would help her to quickly discover what the word was. There are 4 unscrambling words days and 3 days of crossword puzzles scattered throughout. They serve as fun review days. There are images to colour or circle, building words with blocks or scrabble letters, and other various spelling activities my 6 year old enjoys. 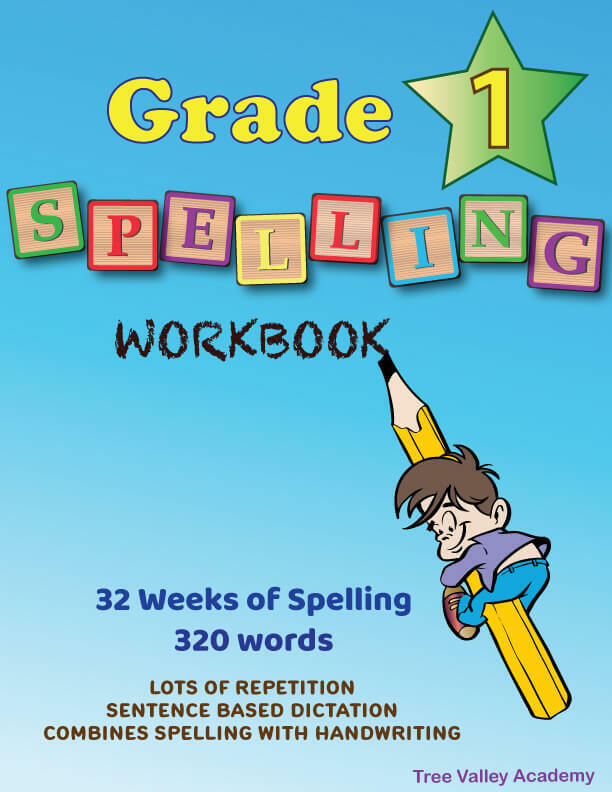 The Grade 1 Spelling Workbook can be purchased and downloaded from my online store. Will it be a good fit for your student? The only way to know is to try it out. I am happy to let you try the first 11 of the 230 days free. Feel free to ask me any questions about the workbook in the comments below.